Our Gala went remarkably well this year, it saw the return to traffic for the first time in preservation of 33 002, which as an unknown quantity is always a little nerve racking. We needn't have worried though, she performed beautifully and appears to be quite strong for a 33. The load regulator, the generators, field diverts and traction motors all worked fine, all bits that were rather unknown quantities. We believe 33 002 last run eight or nine years a go and was just switched off and abandoned after that, so it was a very big day indeed. 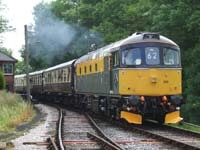 The highlight was the last run on the beerex train on Saturday night, 33 002 piloted by D7612. They sounded well together! All the other locos performed faultlessly, including the 20s in multiple on Sunday. The weather was kind to us and we all enjoyed ourselves, so we hope our visitors did too!